AAHPM's Intensive Board Review Course: the ultimate live in-person prep that includes a pretty stellar cast of speakers including Mary Lynn McPherson, Kim Curseen, Sandra Sanchez-Reilly, Joe Shega, Drew Rosielle, Michelle Weckman, Scott Schwantes, Janet Bull, Jeff Spiess, and Gregg VandeKieft. The course takes place this August 9-11, 2018 in Minneapolis, MN, and will include both lecture based content plus lots of exam-type questions to help you pass the test (and brush up on your hospice and palliative care knowledge). Plus you get to hang out with a bunch of cool palliative care colleagues. 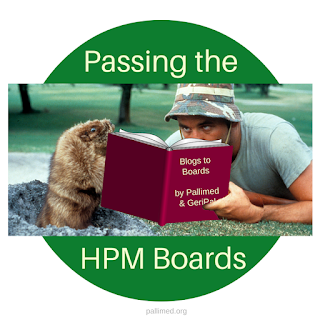 The Pallimed/GeriPal Blogs to Boards Questions: yes, it's slightly dated but hey, so are the exam questions (it takes a couple years for the exam questions to get into real life circulation). Plus, the great thing about these questions is that we can update them on the fly. So if you notice a question or answer that needs updating, send the edits our way and we will make the changes. Essential Practices in Hospice and Palliative Medicine: For those who've been in the field for a while, you may remember the book series called "UNIPAC". This was our go to resource when studying for the boards 10 years ago, and remains so today, just with a different name. It's a comprehensive 9-volume self-study tool that has been completely updated for its rebranded "Essentials" name. Plus it comes with an online confidence-based learning module to test your level of knowledge and level of confidence in each topic area presented in the book series. We would love to hear what other resources you have used and found helpful. Add them below to the comments section.